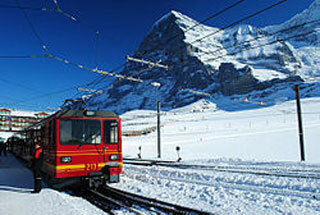 The Jungfrau railway is a railway which runs 9 kilometres (5.6 mi) from Kleine Scheidegg to the highest railway station in Europe at Jungfraujoch (3,454 m), between the Bernese Oberland and Valais in Switzerland. The railway runs almost entirely within the Jungfrau Tunnel, built into the Eiger and Mönch mountains and containing two stations in the middle of the tunnel, where passengers can disembark to observe the neighbouring mountains through windows built into the mountainside. The initial open-air section culminates at Eigergletscher (2,320 m), which makes it the second highest open-air railway in Switzerland. This article uses material from the Wikipedia article "Jungfrau Railway", which is released under the Creative Commons Attribution-Share-Alike 3.0 License.